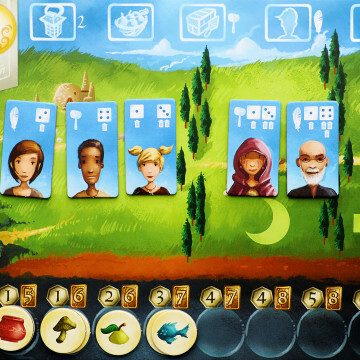 Patchwork is a game of clever choices, sewing puzzles, and of making the right move when needed. It is the high stakes world of quilt making. Smart timing and wise investments can mean making a beautiful piece, worthy of being passed down through your family for generations. Now, that might not sound like an engaging or deep theme, but this little 2-player gem by Uwe Rosenberg is full of fun, tough decisions and Tetris-like tile placement. With a short playtime it’s the kind of game you’ll want to set up again right after finishing a round. 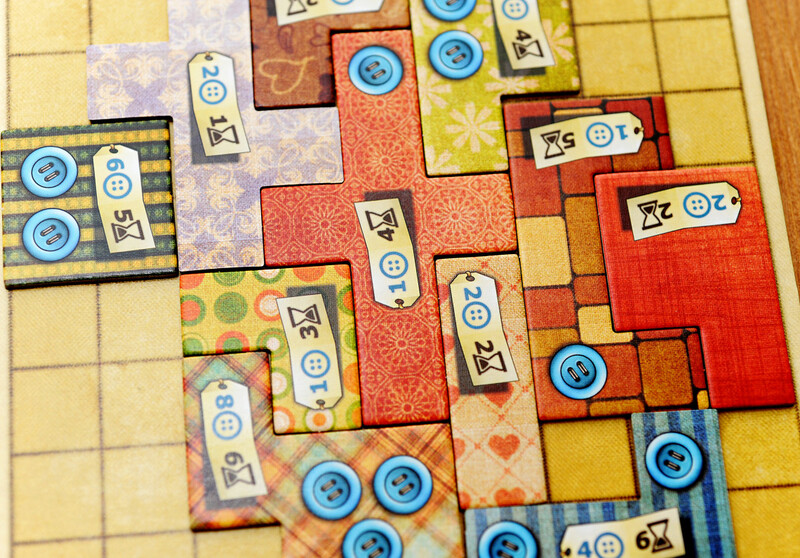 In Patchwork the two players each start with a wide open 9 x 9 quilt board. A circle of all the available quilt patches is randomly laid out in the play area. The patches are a variety of shapes and styles. Some are simple straight lines or squares and others are L’s X’s or more complicated shapes. They each have a cost in both buttons and/or time. Some of the patches will have buttons on them (which is both the currency and points of the game). There is also a time board which tracks the time spent to complete actions as well as act as a time limit for the game. The goal is to end the game with the most buttons; a noble pursuit to be sure! 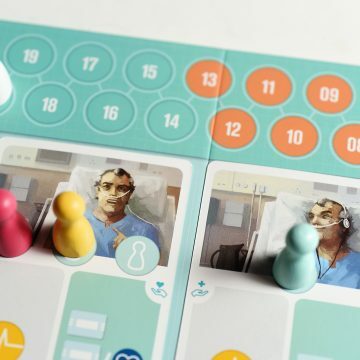 Players will be dealing with two resources: buttons (which are used during the game to acquire more patches) and time (which determines turn order among other things). On a turn a player will either take a new patch and add it to their board or catch up and pass their opponent on the time board, earning buttons for their trouble. A neutral pawn is placed in the circle of patches and it indicates which of them are available for purchase. The three patches following the pawn are the ones currently up for grabs. If a player chooses to buy a patch, they move the token to the spot they took the patch from and that creates a new set of available patches for the next player. When buying patches you pay the cost in buttons and advance your token on the time board the indicated spaces. If you are still the trailing player on the time board you will go again. In this way a player can have multiple turns in a row. Be careful when placing patches on your quilt board. Once they’re set down, they’re locked into place. Just like any good quilt you want to leave as few holes as possible. There is also a seven button bonus for the first player to build a complete 7 x 7 quilt. It’s not necessarily enough to build your whole strategy around it, but very nice if you do end up with it. If you can’t afford any of the three available patches or just don’t want them you can advance on the time board to earn some quick buttons. You’ll get a button for each space you move until you’re ahead of your opponent. The time board also has some checkpoints on it, indicated with buttons. As you cross that line you’ll earn income equal to the buttons you have in your quilt. The game ends with a final checkpoint, so you want to maximize the amount of buttons you have on your board by that time. There are also special single-square leather patches at different intervals on the time board. The first player to reach these spots gets to add those patches to their board – perfect for filling single space gaps in your quilt. The game ends when both players have crossed the last button checkpoint of the time board. Then it’s time for final scoring. 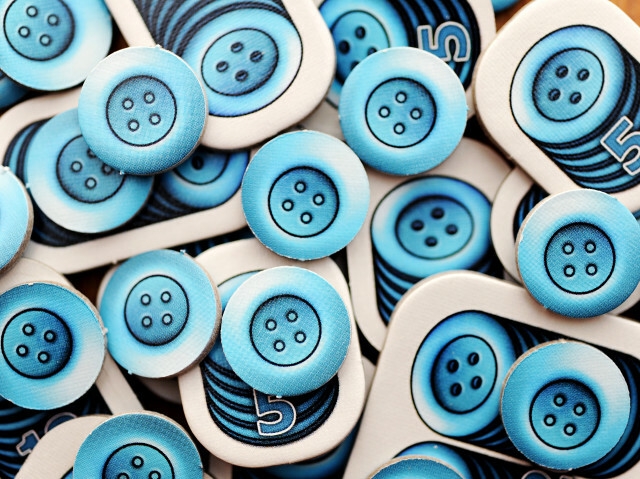 Players count the amount of empty spaces on their quilt boards and subtract two buttons for each space. Just like in life, the person with the most remaining buttons wins! 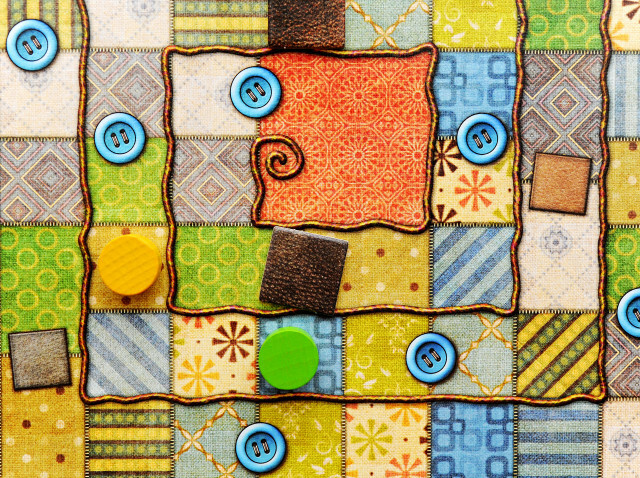 It’s a tricky little brain burner, but Patchwork is a heck of a lot of fun! I have to say it’s really nice to see Rosenberg stretch his creative muscles away from the heavier worker placement games he’s now so well known for (Agricola, Caverna). I am a huge fan of this game. It’s really easy to teach to new players and could definitely replace Lost Cities as my go to gamers two-player game.